Update 4-26-09: I see this page is getting a lot of hits from Google in the wake of the Swine Flu outbreak in in California and Mexico. Please note that I am not suggesting this new Swine Flu is likely to be even remotely as dangerous as the 1918 flu! This post was written before the outbreak and was mainly supposed to be pointing out a curiosity. If you want to learn more about the present outbreak I highly recommend the Effect Measure blog. My own blog posts on influenza are mainly focused on the underlying molecular biology and immunology, rather than the epidemiology that’s of special interest now. You may also be interested in the Google Flu Tracker; but note that it’s probably not accurately reflecting case number at the moment. This turns out to be an old hypothesis that I had never before run across, not a brand-new insight; but it’s still a holy crap moment for me. Turns out the 1918 flu never left. Its great-great-grandchildren are still out there – mutated, more or less harmless to man, but still recognizable. In the same way as the dinosaurs still roam the Earth, chirping and clucking, the 1918 influenza virus became swine flu. Vincent, the “holy crap” is strictly because of my own misconception — I had (mis)understood that the 1918 strain had disappeared completely with no descendants. (My assumption was that there was enough immunity among the humans after 1919 that the strain couldn’t make any more headway, and was replaced by more successful strains.) I hadn’t realized it had left any descendants at all, even reduced-virulence descendants. Is there a phylogenetic tree of flu strains somewhere? (I imagine there would be a lot of horizontal links.) I’d be interested in seeing parent/descendant relationships among circulating strains for the past 50 years. Do any strains die out without leaving descendants, or are there progeny of all the strains for the past century still in the wild? Actually, probably I need to ask the question better first. Influenza viruses of all known HA and NA subtypes are maintained in avian species (http://bit.ly/CSVWV). This observation has lead to the hypothesis that all mammalian influenza viruses are derived from the avian pool. Curiously, evolution rates of avian strains is much lower than in mammals. There is a good phylogenetic tree in Fields Virology, Figure 48.2. 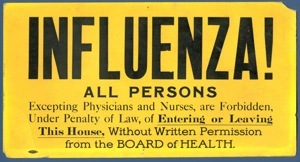 Does anyone else see certain similarities between the 1918 Spanish Flu with the current influenza attacking Mexico? i have been going to james mc Canney site over5 years i highly recomend, if you want the real story about the disinfomation idiots.james can set the record straight.with his real PHD.and X nasa man comet lunin on about feb 26 and now line up of venus earth must pass through the tail dust .this is a plasma discharge, venus came in as a comet and not billions of eons ago. that is a lie. I have a question I’ve not been able to get an answer to in numerous searches. I know the 1918 outbreak left the survivors with natural immunity. But what about their offspring? Are there any studies on them (I happen to be the grandchild of a survivor) that show a passed down immunity, or is it empirical? I’m having a raging debate with a moron, and he’s asking for studies, and I thought I’d heard of at least one, but can’t find reference to any. Whatever help you can give would be greatly appreciated, since I’d like to know, personally, the argument that I undoubtedly want to win, notwithstanding. Learned immunity doesn’t pass down through the generations as it’s not encoded in the germ-line, only in particular memory cells. you won’t have your grandparents’ learned immunity to the viruses/bacteria/parasites they encountered in their lives, only their germ-line encoded innate immunity. Thank you! I figured it was something like that, but didn’t have the vocabulary to explain it, since I haven’t had science classes in about 25 years. My arguement focused on the fact that survivors were heartier to begin with, passing that down to stronger subsequent generations. He was arguing that pandemics did not produce healthier populations over time, because they did not pass direct immunity. I told him that it was not a matter of passed on immunity, but rather a broader effect of weeding out the weak of a species over time. Simple observations of Darwinian theory. Antibodies are passed from mothers to babies in milk, which gives the babies some short-term protection from various kinds of infection. But is there any longer-term benefit? My understanding is that once the antibodies go away (I guess this happens within weeks), so does all the protection, but it occurs to me that I don’t really know that. Are there ever cases where something passed from the mother to the baby gets the baby to produce his own B and T cells targeted to the antigen? Are there ever cases where something passed from the mother to the baby gets the baby to produce his own B and T cells targeted to the antigen?